Studying can be difficult. When you were searching for a college, you probably never imagined it would be so hard and so much. You might read one sentence and think you know what the writer’s talking about, but as soon as you read the next paragraph, you’re lost. You can’t remember what you read and you don’t really understand the topic. But you have to; this is knowledge you need for an upcoming test, and it’s what you need to know to get ahead in your career. Understanding the material, remembering it for the test and being able to apply it to a career is important, and challenging, no matter if you’re an online student or if you’re in the classroom every day. 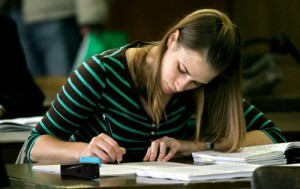 Here are five simple tips to help you study. Your brain is a muscle, and like any muscle, it responds well to repetition and routine. Choose a study area in your house, at the library, or at your favorite (quiet) coffee shop. You want the same area, even the same desk, everyday. You want to choose a quiet spot, and you want to have all of the supplies you’ll need readily available to you, including food and beverage. Don’t forget anything; you want to stay in that spot without any distractions. Visit that area at the same time every day. After a few days, your brain will be ready to concentrate as soon as you approach that spot. Study every day for the same amount of time. Never cram! Cramming only leaves you exhausted for the test, and you’ll never remember the info two days later. Choose an amount of time that is right for the class you’re taking. You’ll have a good sense of what the class requires by asking your professor and after studying for the first few days. Once you choose an amount of time (an hour or two per class is usually more than sufficient), set your stopwatch, and then hide it so you’re not constantly looking at the clock. Don’t leave your study area until the stopwatch goes off. If you run out of things to study before the time is up, great! Review the previous chapters. If you’re writing a paper when the watch goes off, stop even if you’re mid-sentence. That will give you somewhere to pick up the next day. And remember, always reward yourself: Shut the book, put down your highlighter, and take yourself out for a milkshake! Have you ever noticed yourself highlighting almost every single sentence in the book? It’s sometimes difficult to know what to highlight. Everything seems important. Read the entire page of text before you make any highlighting marks. Then go back and choose the most important sentence in that page. Ask yourself why it’s important. Is it introducing a new idea? A new key word? An important quote or date? If so, highlight it AND write it down in your notes. Keep your notes, and your highlighting, to a minimum. Think about it this way: the information has to earn a highlighting line or a place in your notes. Is it worth it? Usually, the first sentences of a section are the most important; they introduce the idea that the rest of the paragraphs will be discussing. Also, usually anything in bold or italics is emphasized because the textbook writers want you to remember it. Finally, always read the chapter or section reviews. Most likely, your professor will use these review pages to design a test, and they will give you an idea about what you should be highlighting. You don’t have to be sitting directly across from other people in order to have a study group. In fact, your study group doesn’t even have to include other students from your class. Use the Internet. Look up the topics you’re studying, and talk to other people on discussion pages about those topics. Become an expert on your topics; don’t just rely on the textbook to build your knowledge. If you can start a study group with other students in your class, chat online at previously scheduled times and introduce them to the information you’ve learned from reading other material and talking with other people. Also, make sure to include your professor in your community; he or she is your most valuable resource, and a person you should communicate with on a daily basis. Professors are always eager to help students who are eager to learn. First and foremost, be healthy. Eat well, get a lot of sleep, and keep a positive attitude going into your test. Study by going over your notes and your highlighted marks, and rereading the review sections of each chapter. The best way to learn and retain information is to teach it to someone else. Pull a friend or family member aside and see if you can teach that person something from your class material. Also, have that person help you with flashcards (which of course only contain the most important ideas from your textbook or study material). While you’re taking the test, start with the easy questions. If you have to skip around a bit in order to get into a rhythm, that’s fine. Build your confidence. If you don’t know an answer and it’s a multiple-choice test, narrow it down to the two most likely answers and choose between them. If it’s a short answer test or a math or science problem, give it your best try. You might get partial or half-credit. Before the test, take a deep breath and be calm. Trust yourself. This really helped me you guys you should try it I got a A on my History Exam I usually get a B or B+ this really does help. yeahh no its doesnt work for me i can never study, and like even if i do, i dont do very well on my test! I think I have changed my life a little bit but that’s enough good .